Creation, 2D to 3D Conversion, Layout & Printing. 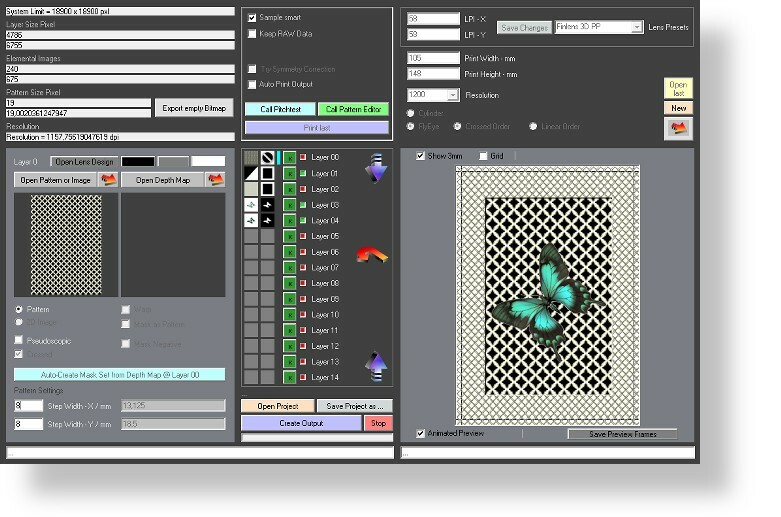 Professional software tools for all aspects of lenticular creation and production. At the centre of every lenticular software is the Interlacer and 3DZ v7.0 is the culmination of over 25 years experience in lenticular creation and production. Designed and developed in-house, every aspect of interlacing images for lenticular is taken into account, making 3DZ v7.0 probably the most comprehensive lenticular software available. Aimed at professionals, you are not just buying a piece of software, but a complete and comprehensive technology transfer package that includes a lifetime of updates, support and technical assistance in all aspects of lenticular. The 2D to 3D converter generates photo-realistic, volumetric 3D frame sets from 2D bitmap images. These can be anything, from photographs to objects. The required depth map can be drawn by hand in the program or imported from other programs, for example elevation data from 3D maps, depth maps from light field cameras or Z data from focus stacking programs, etc. With the 3DZ Layout and Printing software you can print lenticular pictures of the highest quality. Direct printing on inkjet, thermal and laser printers or transfer to RIP systems. The production of single images, large formats and short runs is no problem. The software allows you to step and repeat to your specific sheet size and printing process. Comprehensive adjustment and positioning also lets you place interlaced lenticular image files to be centred to specific lens angles given the type of effect that is to be produced. Infinity 4D is unique software where image and text content can be encoded so that the results are suitable for creating 'hide and reveal' or hidden image security features in product and brand protection. The images are only visible by placing a corresponding lenticular lens film over the resulting image. Ideally suited for easy verification and identification of any item that needs to be confirmed as genuine. Infinity 4D also has the benefit of being able to create some stunning effects when used with lenticular lenses, such a pseudo foil or metallic effects without the need for metallic inks or foils, as well as tremendous variable continuous depth moire patterns. Space effects or 2D picture elements can be placed on up to 15 levels. Spherical and hexagonal lenses are supported. Fly-Eye-like effects can also be printed on normal lenticular films. A revolution in the creation of 3D Integral images. Our software creates integral images from rendered or photographed sources for all Fly-Eye and Integral lens types. One of our developments is the 2D to 3D conversion for integral photography. This means holographic 3D representations of almost any object can be created in no time. ZMap makes 3D lenticular images from stereo image pairs . eg from MPO files. This program is specially made for classic portraits. Slitscan photos are images of space and time. Spatiotemporal images (as it is termed) has nothing to do with 3D or Lenticular, but we believe it to be an interesting and creative way to create alternative artwork and new 'unreal real' objects and scenes from photographic sequences . A great marketing and advertising tool. Slitcan creates images that catch your eye and make you think!